I bought 6 dozen for $11/doz. Figured I couldn't really go wrong at that price. Ball is extremely soft. You cannot get a softer ball. It is terrific around the greens. On two occasions today I was wowing my group with amzing stopping power on two delicate little chips. On one the pin was tucked in the back of the green, and I was sitting about 7 yards off the front in the fairway grass. Total carry to the pin was about 25 yards. I hit a lob wedge (tucked back in my stance), and the ball got no higher than 15 feet off the ground. The ball hit the ground, bit dead and actually spun sideways a few inches. I mean it spun on a shot where the pin was only 25 yards away!! One of the members of my group told me he thought the ball was going right off the back of the green when he saw it in flight. On another ocassion I stopped the ball going downhill from the rough!! Give me a break! That time it left me 15 ft away since I never thought it would stop in that situation. Approach shots are excellent. Buttery soft, and no ugly side-spin effects either like with other soft balls like ProV1's. Now the downside....This ball is short. The shortest ball I've played in a few years. Today, I had four situations where I should have flown bunkers and I didn't. It could be as much as 15 yards short. The feel putting, and with the wedges is incredible. Does it make-up for it's shorter length?? Well I shot 4 strokes today below my average, so overall it helps. It probably cost me three with it's short distance, not allowing me to fly hazards I normally would have. I'm torn. Overall, I'd have to say the loss in distance does not overcome it's great feel since other balls can be had that have a better trade-off ratio. But at $11/doz, I'll find a way to get good use from them, but I won't buy anymore after I use them up. But man can this ball SPIN!!!!!! Pro v's,Callaway HX's,Mike One, Maxfli A10 M3tour, new revolution tour you name it I've hit it looking for that magic and I have had them all this time. Very nice allround ball. Haven't used them on a long course yet so can't comment too much on distance, but suspect slightly shorter through the bag than solid construction balls. More than makes up for it with wound ball feel around the greens. Fantastic for chipping from just off the green. Stops nicely on full shots, not too much spin and very predictable. Manufacturers hype and todays obsession with distance is probably the reason this type of ball isn't being made any more. If you'd rather impress your buddies by being 10 further off the tee, but don't mind watching it roll twenty feet past the holes on chips around the green, get the new solid construction balls. If you are more interested in actually scoring lower this ball is recommended. Very similar to the old HT urethane which was my favourite ball but was discontinued a couple of years ago. Maxfli made a huge mistake discontinuing wound balls. Great golf ball at great price. Excellent soft feeling while chipping and putting. No significant distance losing on driving. Grab as many as you can while it is still out there ! Great golf ball. I was a Revolution fan, but purchased a few boxes of these on clearance last year after having read that they were Maxfli's "softest ball". I am always looking for a ball I can stop on hard greens. These will definately stop. Because it is a soft ball, I expected a noticable loss in distance. Wrong. This ball still renders good distance, and feels great with the putter. It doesn't come out of round as easily as other wound balls (notably the Titliest Professional). I get at the ball pretty good (especially with a driver), and I can still play a whole round with one or two. I gave 2 dozen of these balls to my father (shoots in the 70s) who traditionally plays hard titanium rocks...He now swears by these Maxfli Elites. I probably have enough to last until next year this time. Maxfli, if you are reading this...bring this ball back! I can't get my father to give back the ones I gave him. One reason people claim the ball to be short could be caused by the liquid centre construction. I used to play Titliest Balata some 3 years ago. They share the same ball construction. Balata balls are know to go shorter off the tees. This is due to the weight of the ball. However, I'm a sole supporter of the Revolutions, so the Elite is one step better I would say. I bought a box of Elite balls earlier in the year but never had a chance to play a round with them. 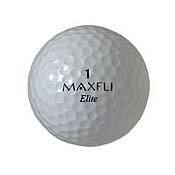 I LOVE the Maxfli Revolution ball, I play this ball the most, and I’m very disappointed that it is no longer being made. Anyway, played a round with several different balls, including the new Precept U-TRI ball (which is nothing to shout about at all) and a few of the Elites. The ball was outstanding !! The Elite ball, I only had to use one, hit, much to my surprise, further and straighter than ANY of the other brands, some touted as long and straight- low spins models. I highly recommend the ball and don't ever think the ball is short. Heck, Its all about hitting the ball on the sweet spot anyway, mis-hits never fly regardless of the brand. Right now, I’m trying to buy as many Revolution balls as I can, I will also add the Elite to my inventory. Good hitting to you all. I have found this ball to be very short off of the driver and long irons. I am coming up at least 15 yards shorter than when I played the Titleist Professional or Pro V1. I have also found the balls to be very inconsistant on their performance. I bought three dozen and each sleeve has been an adventure. One sleeve of balls can be straight and long, and another sleeve I would come up short. They do feel great for putting and right around the greens. All in all I am giving up on these balls. Since I started playing them my game and mental state has suffered. Everyone can choke on their 60 dollar boxes of balls. I think this ball is better than both revolution models - spins better, carries further, and rolls truer - and if you can still find them anywhere it's less than half the price of the others (and I got them for 25 CDN, which is about two bits USD). Good enough for Jack good enough for me. all Maxflis, all Stratas, all Precepts, all Srixons, all Titleists, and Callaways can jump in the pond where they deserve to be. Wow, why the bad hype, i bought them on closeout for 19.99 a dozen. They are decent. Distance is kinda mediocre but the spin and feel are great for the price. the ball will stop and drop.